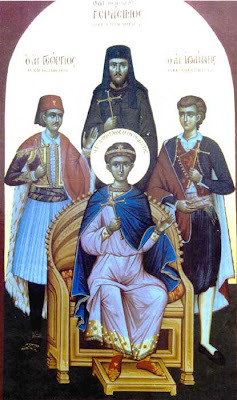 Among the Saints celebrated today (October 21st) is the Neomartyr John, from the town of Monemvasia in the south-east Peloponnese in Greece. Below is a brief summary/translation of a truly inspiring Neomartyr of our Church (from http://misha.pblogs.gr/2008/10/21-10-giortazei-o-15hronos-neomartyras-iwannhs-apo-th-monembasia.html). 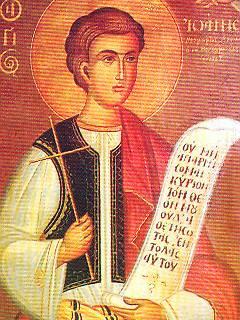 Saint John was born in 1758 near the city of Monemvasia. His father was a priest, and from a young age he tried to emulate his father's life by work in the church, etc. He was remembered by his behavior and example to other children as a "priest's son". In the year 1770 the droves of the Albanian Hatzi Osman, having defeated the Greek resistance, and arrived in John's town, and killed his father and enslaving himself and his mother. They were taken to Larissa, where they were sold-off separately two or three times separately. After two years they were bought by the same man, a Turkish landowner. This Turk did not have any children, and seeing John's talents (who was exceptionally smart for his age, willing, obedient and nimble at work) he thought along with his wife to make John their God-child. Therefore, every day they tried to convince him to leave the faith of the Christians and become an Ottoman. Initially they tried to convince him with flattery and promises, but later they used terrible tortures to try to overcome the steadfastness of John (who was only 15 years old), who kept the Christian faith unwavering. One day his master, tired of trying to convince him to convert, in anger lead him to the courtyard of the mosque. Many moslems were gathered there, and with blows and terrible [σπαθισμούς? threats?] they urged him to convert and become a Turk. John's answer, however, was clear: I am not a Turk, I am Christian and I want to die as a Christian. Besides this, the Turk and his wife tried every day with magic and evil seductions to get the Saint to loose his head and give in to carnal desires and then to become a Turk. But, John, having God inside of mean, remained clean from everything. Divine Grace protected him from all diabolical devices of the Turk's wife. Soon came the 15 days of fasting before the Dormition of the Theotokos. The Turk realized that John did not want to spoil the fast, so he locked him up in a barn. He kept him there for the entire 15 days and [hanged him? κρεμούσε? maybe it means choked him], lit fire to the straw to cause smoke, and hit him with a sword, all while trying to make him eat and to spoil the fast. But Saint John did not even taste the food, but prayed to the Virgin Mary to help him not to break the fast, but to prefer to be killed than to spoil his fasting. Later after this response the Turk [put him in prison? εξαγριωμένος?] and on October 19th 1773, gave him a fatal stab in the heart. After two days Saint John died and received the crown of martyrdom. His memory is honored by our church on the 21st of October. Θείον γόνον σε, Μονεμβασία, * ανεβλάστησε, καρποφορούντα, * Ιωάννη τας της πίστεως χάριτος, * των γαρ πατρώων θεσμών αντεχόμενος, * τους εκ της Αγαρ αθλήσας κατήσχυνας. * Μάρτυς ένδοξε, Χριστόν τον Θεόν ικέτευε, δωρήσασθαι ημίν το μέγα έλεος. faith, for keeping the commandments of the fathers, and putting to shame those of Hagar by your struggle, O glorious Martyr, entreat Christ God to grant to us the great mercy. May St. John intercede for all of us!